The government would have us believe that the country is doing very well economically because it has over $18 billion of reserves. This is nonsense. The economic state of a country is reflected from the extent of poverty, the human development index, its GDP growth, increase in manufacturing, agricultural growth, its national debt, the debt-to-GDP ratio and several other such yardsticks. In almost all cases, Pakistan is performing very poorly. In the Human Development Index, Pakistan has stagnated at 146 in ranking out of 187 countries, with no change in 2014 as compared to 2013. In comparison Sri Lanka improved its ranking dramatically from a rank of 92 out of 187 countries in 2013 to 73 in 2014. Similarly both Nepal and Bhutan have forged ahead of Pakistan with rankings of 145 and 140 leaving, nuclear Pakistan behind. Both Bangladesh and India are also ahead of Pakistan with improved rankings in 2014 of 142 and 135 respectively. What a shame. Till when will we continue to deceive our people that all is well? The reality is that Pakistan is sinking rapidly in debt. Those who have read the book ‘The Confessions of an Economic Hit Man’ (www.economichitman.com) written by former CIA agent John Perkins would be able to recognise the situation that he described. He made some truly shocking revelations of how certain selected countries are brought to their knees by huge loans that are given to them by international funding agencies. These loans are not put to good productive use but billions of dollars are frittered away in huge infrastructure projects with massive kickbacks to the top leadership and bureaucracy ruling those countries. Pakistan is an obvious target because it is a nuclear power and we see the memoirs that John Perkins has described in his book of happening in other countries being played out in reality in Pakistan during the last decade. In the last 10 years Pakistan has received a colossal amount of $49 billion in foreign loans, a third of which has been used for budgetary support. 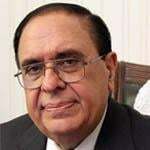 Much of this money has been siphoned to foreign bank accounts by two of our former leaders whose mega corruption cases are under investigation by NAB and other agencies, but with little progress as corrupt persons have also been at the helm, appointed by the country’s corrupt leadership. The huge debt has become unsustainable as more and more is needed to pay back the old loans with interest. On average Pakistan has been borrowing $5 billion each year for the last 10 years and repayment amounts are increasing each year, with added interest. Soon we may be faced with the choice of either giving up our nuclear assets, which seems to be the real motivation behind these readily available loans, or facing bankruptcy. The present government seems oblivious to this situation and is continuing the illegal policy of the PPP. According to law, the debt-to-GDP ratio cannot be beyond the statutory limit of 60 percent but the present government has failed to bring it down. The huge inflow of funds has facilitated the corrupt in power. The 18th Amendment to the constitution has also magnified corruption as much more funds have flowed into provincial coffers and then been subjected to loot and plunder, particularly in Sindh and Balochistan. Some of this money has been used to promote terrorism. It is now imperative for the survival of the country that we stop taking further loans and focus on reducing the national debt. It is equally important to catch the crooks in those provinces where corruption is rampant and give them exemplary punishments with no plea bargaining. This can only be done if all mega corruption cases are immediately transferred from NAB and other investigating agencies to military courts so that they could be decided before the year ends. Gen Raheel Sharif needs to give this matter the very highest priority as the future of the nation is at stake. The big fish must be caught and punished. Once this huge hurdle is crossed, we can start focusing on the process of socio-economic development. In order to build a strong knowledge economy, Pakistan needs to rid itself of the constraints of a natural resource-driven approach to socio-economic development and focus on strengthening the ‘triple helix’ of the knowledge economy – the three key pillars necessary: (a) government policies directed at strengthening the knowledge and research base and enhancing manufacturing and exports of high technology products; (b) the establishment of world class universities and centres of excellence in key fields; and (c) promotion of the private sector so that strong linkages can be established between industry/agriculture with national research institutions, R&D within private sector institutions can be promoted through incentives and high technology manufacturing exports can be enhanced. There are lessons to be learned from countries such as Singapore that have virtually no natural resources but have focused on research and manufacturing of high technology products. The result: Singapore has astonishingly high exports of over $450 billion annually compared to only $30 billion annually of Pakistan, a country with a population about 40 times that of Singapore. Mechanisms should be introduced so that the benefits of technological growth reach the people with the aim of impacting and improving the quality of life of every citizen of the country. ‘Technology foresight’ exercises should be regularly carried out to assess the present and future needs of technology, niche opportunities for Pakistan and the projected impact of such technologies on social, economic, health and environmental aspects. It is important also to encourage innovation and entrepreneurship. This would involve close cooperation between government departments, universities, the Ministry of Science & Technology, the Higher Education Commission and the private sector. The challenge for Pakistan is to develop a competitive edge at the global level for sustainable development. This will be determined by the ability of our nation to create, acquire and use knowledge for socio-economic development. The science abd technology and higher education sectors have to play a critically important role in the transition towards a ‘knowledge economy’. It is only if we are armed with the right knowledge and skills that we can improve our living standards and provide a decent future to our children. A visionary, technologically competent and honest leadership is critically important for Pakistan’s future. The present system of democracy under the feudal stranglehold has brought nothing but misery to the people of Pakistan. A technocrat government is the need of the hour. For this to happen, the judiciary and the armed forces must together find a solution to the woes of Pakistan. The writer is former federal minister of Science & Technology & former Chairman of the Higher Education Commission. He is also chairman of FPCCI Committee on Higher Education, Science & Technology. third of which has been used for budgetary support. Much of this money has been siphoned to foreign bank accounts by two of our former leaders whose mega corruption cases are under investigation by NAB and other agencies, but with little progress as corrupt persons have also been at the helm, appointed by the country’s corrupt leadership. The huge debt has become unsustainable as more and more is needed to pay back the old loans with interest.